Ah the bouquet! Traditionally flowers weren’t used for the bouquet at all, but instead strong smelling herbs like garlic and thyme were used to ward off evil spirits. Another story tells us that flowers were once used to mask the smell of un-bathed brides back in the Victorian days of not bathing too often. True? I have no idea! Today the motivation behind carrying a bouquet has little to do with masking smells or dissuading demons and more to do with two simple facts: bouquets are pretty and it’s traditional to carry them! Bouquets needn’t be a complicated affair though. As tempting as it may be to simply drop off your requirements at the nearest florist (certainly the less complicated option) you might consider a more hands-on and cost effective approach for your floral aisle companion. For the more carefree and spirited bride, an incredibly simple but gorgeous option would be to walk down the aisle with an armful of roses. Order seven or eight dozen long-stemmed roses (de-thorned but with the leaves left on) from your nearest floral wholesaler and you are pretty much set to go. Red roses are particularly effective and lend themselves to incredible photographs. Just be aware that they look best unbound (a fresh and natural look) and that they can get a bit heavy after a while so a little bit of arm strength is a plus. Another easy bouquet option is to simply pick up a bunch of proteas from just about any grocery store. Proteas are usually bunched together with other beautiful foliage and proteas themselves are not only exquisitely South African but they are stunning. 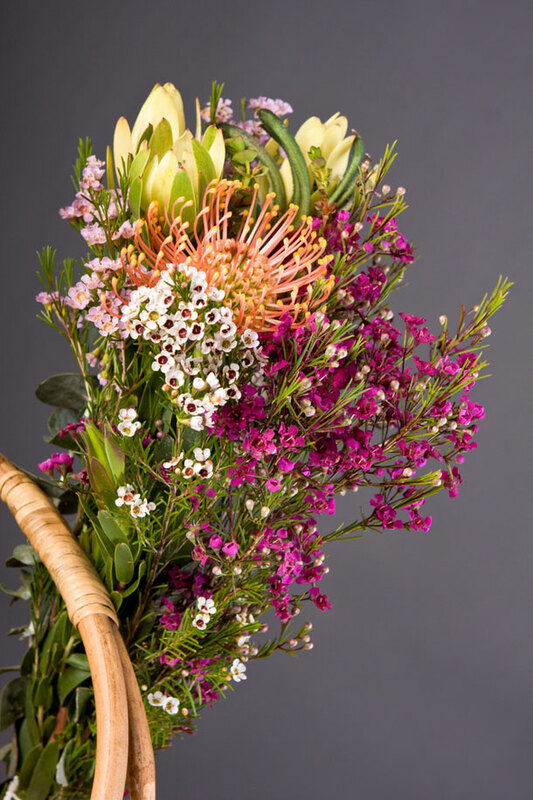 The colours in even the simplest of grocery store bought protea bunches are magnificent and again you have a bouquet that will play beautifully for the camera. If you want a more formal-looking, tight bouquet without the expense then a little effort on your part may be worth it. All you need is a bunch of your favourite flowers (from your garden might be nice, otherwise the grocery store is a cost-effective option ) and a bit of floral tape or wire. Cut your flower stems so that your flowers are all the same length. Choose three flowers to form the centre of your bouquet and tape them together tightly. From there build around the centre, using floral tape often to keep the bouquet neat and tight. Once you are happy with the size of your bouquet finish it off with a piece of ribbon, securing the ribbon with pearl-headed pins. With a little practice there is no reason why you shouldn’t be able to put together something beautiful. And if you’re afraid that you aren’t “creative” enough to pull off doing your own bouquet? Delegate the job to one of your bridesmaids, my dear. That is what they are there for!